Today was a bit of a bugger. We were woken by music playing through the village. It was some kind of religious mantra which we had heard many times around Pokhara. It was melodic, repetitive and very pleasant. We had breakfast but Julian wasn’t very impressed with the local bread and honey. So he started off the day a bit moody. We left our lodge soon after 8 and started walking up through the village. We went up about 300 metres mostly on stone staircases through forests. The sun was shining and before long we were all sweating. Last night I charged up the iphone and a camera battery from the solar panel battery and so today I put the solar panel on my back to charge up that battery. I hope that all made sense. It’s 7:30 at night now and I am really tired. Julian walked really slowly this morning; everything was a real effort. I decided that we should stop for a second breakfast of vegetable soup which Julian enjoyed and then we set off again. Heavy goods are moved along the path by mule trains; there’s mule poo everywhere. You don’t need a guide, just follow the mule poo all the way to top! I told Julian to stand well back as the trains, usually 8 or 10, mules go by. But he’s a 10 year old boy and wants to court danger. Well, I can only tell him so many times. There are also oxen, buffaloes and cows on the route so you really do have to watch where you are putting your feet and stand well back as the animals amble past. After we had been climbing for about 2 hours we reached the top of a ridge and had a great view across the valley and the Modi Khola river below. Unfortunately our route today was to go down to the river and then all the way up the other valley side. So we went down 450 metres through a forest and then up 380 metres on the other side. It was pretty bad. But we passed porters going the other way carrying huge loads. They are super human. As I said to Julian, if the porters can speak English they can get a well paid job carrying light loads and being guides for trekkers. If they can’t speak English, they carry huge loads in advance of tour groups or else whatever needs to be carried up to the higher lodges. I think the lesson wasn’t lost on Julian. In the afternoon on the gentler downhill slope to our destination, Julian found another packet of his mysterious energy and left his poor father far behind again. 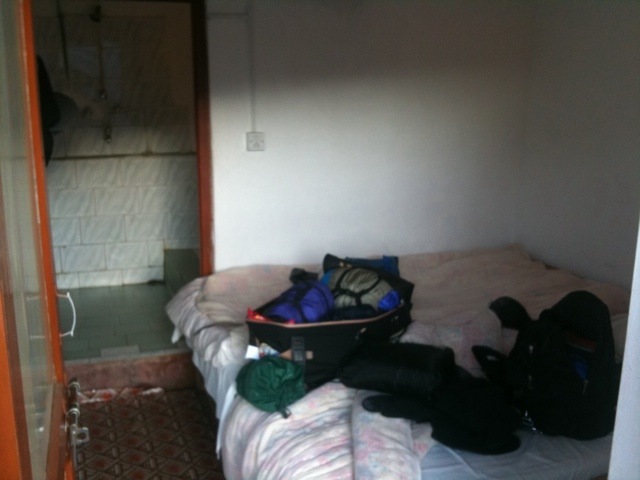 We reached Chhomrong at about 5 and fell into a lodge run by a friend of Narayan. We had been out walking for 9 hours. 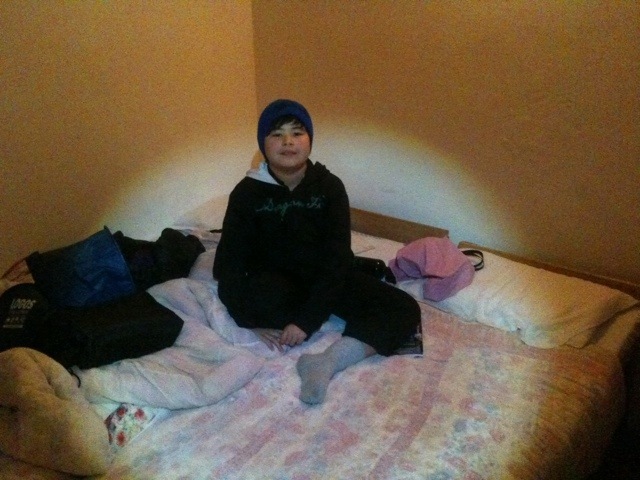 Julian has some small blisters on his toes which I have taken care of and we have decided to stay here for 2 nights. The daily treks from here will be shorter as we get higher – I don’t want to go through another day like today! The good news is that the solar charger completely refreshed its battery in only one day of sunshine so Julian can play Angry Birds on the iPhone tonight. Lucky him. Our room in Gandruck. This one had a shower and an Asian toilet. It cost 900yen or 6 pounds and was the most expensive room we stayed in on the trek. After Gandruck we didn’t bother getting an en suite room again. 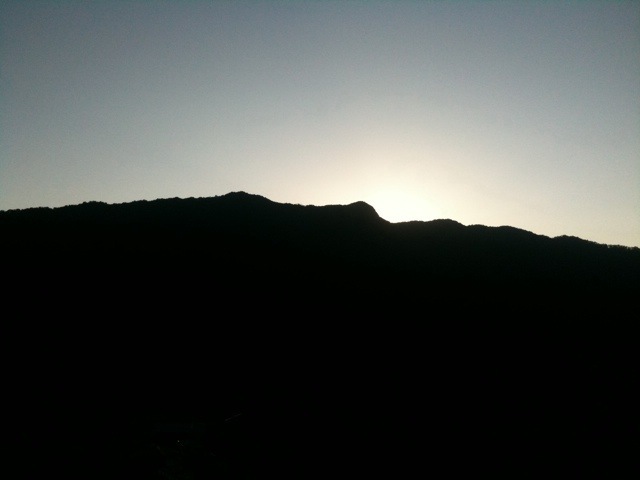 This photo is of a sunrise but being halfway down a valley, it’s not as early as you may think; maybe 8 o’clock.